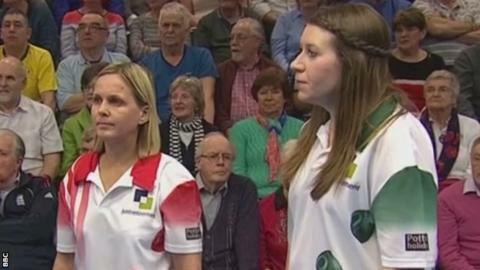 Ellen Falkner has become World Indoor Bowls women's singles champion for the first time in 10 years. The 36-year-old Englishwoman defeated compatriot and 2013 winner Rebecca Field 10-9 8-7 in a tight contest at Potters Resort in Norfolk. Falkner, winner in 2005 and 2006, told BBC Sport: "Rebecca played incredibly well and put me under a lot of pressure. "It was the conversion bowls that were the difference." She added: "There's a lot of pressure and expectation and I'm just glad that we both performed well in the final." Field said: "I was pleased overall. I thought I put Ellen under a lot of pressure, but she was brilliant."